Emer Claddagh Ring by Celtic Rings Ltd. If you and your fiance love all things from the Emerald Isle or have Irish heritage, Celtic wedding rings are a natural choice. There are hundreds of different styles out there, and a few retailers even specialize in wedding bands with Celtic knots, claddaghs, and other Irish motifs. Specializing in Irish jewelry and wedding rings in particular for more than three decades, Unique Celtic Wedding Rings is a great source for wedding bands with Celtic designs. The rings are made in Ireland. You can select the precious metal of your choice for many of the rings. Unique Celtic Wedding Rings offers dozens of beautiful options for your wedding day. The Gaelic Soul Mate Wedding ring is available for men and women. It features the words "Mo Anum Cara," which translate as "soul friend" or "soul mate." The Trinity Knot Wedding Band with Ogham Script Rail is another lovely option. It is decorated with trinity knots and the word "Faith" in Ogham script, an ancient Irish writing. Whether you're looking for a two-tone design or a simple sterling band, you can find it here. You'll find both men's style and women's styles in a range of metals, including sterling silver, white and yellow gold (10k, 14k and 18k) and mixed metals. Prices range from about $40 for a simple sterling silver style to more than $2,000 for 18k gold. Unique Celtic Wedding Rings has a brick and mortar shop, located in Robbinsville, New Jersey. They also have a full selection of rings online, so you can order from anywhere and have your ring shipped to you. Shipping rates vary. Past customers have reviewed this shop on WeddingWire, and their experiences have been very positive. They loved the rings they received, and shipping was fast and safe. If you're considering buying your wedding bands from Unique Celtic Wedding Rings, it's important to note that shipping can take three to four weeks. The rings are made in Ireland, so shipping them to the United States can be time consuming. Rush shipping is available for a fee. Unique Celtic Wedding Rings accepts returns of brand-new rings within three weeks of purchase. If you simply changed your mind about the ring, you will have to pay shipping for the return. They also offer a money-back guarantee if your ring is not top quality. 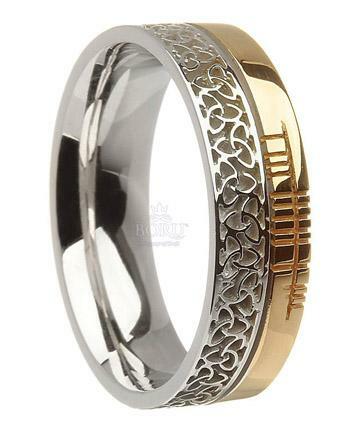 Offering a great selection of wedding bands, Celtic Wedding Rings is another great resource. The company is located in Ireland, but ships rings all over the world. You'll find a number of Celtic band options here, whether you're looking for Celtic knots, claddagh rings, or bands with Irish writing on them. Most styles are available for both men and women, so you can order matching rings or simply choose the ring that suits each of you the best. The lovely Aileen Trinity Wedding Ring features a simple repeating design of trinity knots in 14k yellow gold or a two-tone yellow and white gold design. The Emer Claddagh Wedding Ring is another beautiful option, with a two-tone claddagh design in 14k gold. Most of the rings are in 14k yellow gold, 14k white gold, or a combination of both yellow and white gold. A few options are also available in sterling silver. Sterling silver rings are less than $100, and the gold bands range from about $700 to $2500, depending on whether they have diamond accents. Celtic Wedding Rings does not have a brick and mortar shop in the United States. They are located in Ireland, but you can shop the full selection of rings online. 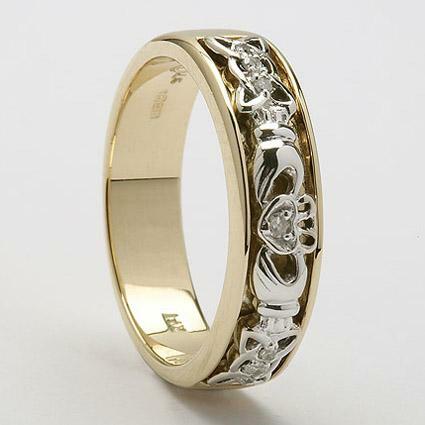 According to reviews on Reseller Ratings, Celtic Wedding Rings has many satisfied customers. Consumers praised their prompt response to any dissatisfaction, the quality of the merchandise, the great service, the perfect sizing, and the fast shipping. Since each ring is made to order and shipped from Ireland, it will take between two and three weeks to get your wedding band. All orders over $200 are shipped free of charge. The rings come with a money-back guarantee, and you can return most non-customized ring for a period of 30 days after purchase, as long as you have the original packaging. You may have to pay a 15% fee for restocking. If you need more ideas for your wedding bands, check out sites that sell engagement rings as well. Many sites that specialize in Celtic engagement rings also have an extensive selection of wedding bands. You'll find items for famous brands like Shanore, as well as lesser-known manufacturers. As you shop for your Celtic wedding bands, take some time to consider the selection at a number of shops. It's also a good idea to understand something about the store's policy and reputation, since your wedding ring is a major purchase. By taking your time and doing your homework, you'll have a wedding band you'll love for the rest of your life.